Longtime readers of Under the Hollywood Sign might recall my 2010 post on cultural and linguistic misunderstandings in American reviews of Japanese films. In it I talked about two films by Hirokazu Kore-eda, “Nobody Knows,” and “Still Walking,” both of which were significantly misinterpreted by American critics. Since then, Kore-eda has gotten better subtitling and some of the critics have gotten more savvy: in fact, Manohla Dargis got through her review of his latest film “Like Father, Like Son,” without making any gaffes. “Like Father, Like Son,” which won the 2013 Jury Prize at Cannes, is the story of two boys switched at birth and given to two very different sets of parents. (There have been a number of baby-switching cases in Japan, including a particularly tragic one that was only just resolved, sixty years after the two newborns were given to the wrong parents.) 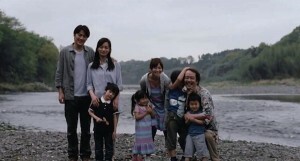 The film’s protagonists are the Nonomiyas, a well-off Tokyo architect and his stay-at-home wife, whose adorable son Keita turns out to be biologically unrelated. (There’s a casting problem here, as Keita actually resembles Nonomiya more than his biological son does.) The Nonomiyas’ biological son Ryusei has been raised by the Sakais, an earthy working class couple who own an electrical supply shop in a provincial city and have two younger children. Informed of the DNA results when the boys are six, Nonomiya is not only determined to have Ryusei returned but to hold onto Keita. Despite his workaholic life and tepid interest in fatherhood, Nonomiya uses his means, education and sleek Tokyo apartment as justification for gaining a son and keeping the one he has raised. Before he broaches the subject with the Sakais, however, a period of visitations ensues, with Keita having boisterous fun with the Sakai family and Ryusei cooped up in the apartment with Mrs. Nonomiya, since his father is usually working. What’s fascinating about the story is not so much the obvious lesson–that your child is the one you’ve raised, regardless of blood–but the class element, and this is what the critics mostly missed. Throughout much of the post-WWII era, Japan has prided itself on being a middle-class country, one in which the vast majority share a similar standard of living. No more: while Japan still lacks the yawning income and cultural divisions of the United States, its middle-class society is more ideal than reality at this juncture. In “Like Father, Like Son,” Kore-eda makes this point by not having any middle-class characters. The extremely upper-middle-class Nonomiya is horrified at the Sakais’ electrical shop, the back of which constitutes their home, a typical arrangement in Japan. For their part, the Sakais compare the Nonomiya’s highrise apartment to a hotel–and not in a good way. The two families even eat differently, a significant factor in a country whose cuisine is shared across class lines. The Nonomiyas welcome Ryusei with sukiyaki, an extravagantly expensive meal, while the Sakais feed Keita fried gyoza, a festive but cheap treat. But the real cultural difference comes at bath time: Ryusei is explicitly instructed to bathe alone, while the Sakai père bathes with his two boys. Anthony Lane, who reviews for The New Yorker, has it backwards when he writes,”[Sakai] even takes baths with the children.” Japanese bathtubs are deep soaking tubs; all the washing and rinsing is done with buckets before entering. Small children can’t manage either part of the process on their own, hence the tradition of bathing en famille when the kids are young. (The only reason the entire Sakai family isn’t bathing at the same time is because their tub is too small.) Thus the unusual bathing custom in the film is the Nonomiyas’ solitary western-style one. Lane goes on to refer to Nonomiya as a “middle-class professional,” but his fancy apartment building and black Lexus are well beyond the grasp of middle-class Japanese. Not only is he a high-earning architect at an impressive firm but, at forty, he has much of his lucrative career still ahead of him, whether or not he stays on the fast track. Nevertheless, Lane wraps up the review by making an excellent point: that although Nonomiya is the main character, his wife and Mrs. Sakai are the ones who manage “the righting of elusive wrongs.” Lane then suggests a better title for the American remake, “Like Mother, Like Son.” Which would be great if the Japanese title were actually “Like Father, Like Son,” but “Soshite Chichi Ni Naru” translates “And I Become Your Dad,” a typically vague Japanese title. Dreamworks will probably call its version something else entirely, but whatever else is lost in translation I’m sure the class divisions will come through loud and clear. You are currently reading “Like Father, Like Son”: What Was Lost In Translation, And What Wasn’t at Under the Hollywood Sign.